Caiman free games: Ladybug by Jani Parviainen. 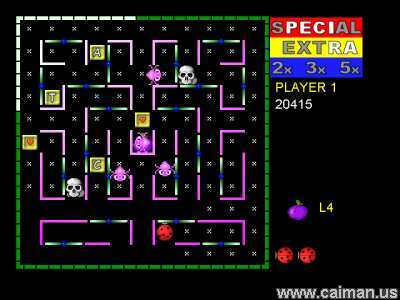 A cool maze / pacman game with old looking graphics. Ladybug is an exciting maze game with some interesting features. You control a ladybug running in a maze, collecting dots and avoiding the nasty evil bugs. Unlike most maze games, there is no way to turn the tables on your enemies, so you're always on the run. Adding some variety are scattered bonuses and letters you can collect to earn a free bug. Ladybug is a remake of Universal's Coleco Vision game. Universal released it in 1982. This version is released in 2004.